Buy 25 or more for $71.24 each. Over 30 hours of audio entertainment on 25 CDs, including episodes: Connie Comes to Town, Gifts for Madge and Guy, Recollections, Thank you God, Connie Part 1, Connie Part 2, The imagination Station Part 1, The Imagination Station Part 2, The Barclay Family Ski Vacation, The Winning Edge, The Meaning of Sacrifice, Hold Up!, Bernard and Esther Part 1, Bernard and Esther Part 2, The Scales of Justice, A Tongue of Fire, The Midnight Ride, Feud for Thought, Double Trouble, It Is Well, Truth Trivia and 'Trina, It Began With a Rabbit's Foot, It Ended with a Handshake, First-Hand Experience, Gone, But Not Forgotten, Top This!, Unto Us a Child is Born, The Time Has Come, Home Sweet Home, Clara, The Decision, Poor Loser, B-TV: Thanks, It's a Pokenberry Christmas Part 1, It's a Pokenberry Christmas Part 2, The Spy Who Bugged Me, The Graduate, A Lesson from Mike, Best Laid Plans, Snowy Day, Broken Window, Welcoming Wooten, Relatively Annoying, The Popsicle Kid, For Trying Out Loud, Hindsight, Blood Sweat and Fears, For Better or for Worse Part 1, For Better or for Worse Part 2, Mum's the Word, Prisoners of Fear Part 1, Prisoners of Fear Part 2, Prisoners of Fear Part 3, Prequels of Love, The Forgotten Deed, Stage Fright, Something Significant, A Thanksgiving Story, A Penny Saved, For the Birds, How to Sink a Sub, Mistaken for Good, Something Old Something New Part 1, Something Old Something New Part 2, Repent After Me, Home Again Part 1, Home Again Part 2, Big Trouble Under the Big Top, Your Servant is Listening Part 1, Your Servant is Listening Part 2, Cycle of Fear, Parker for President, A Very Bassett Wedding Part 1, A Very Bassett Wedding Part 2. 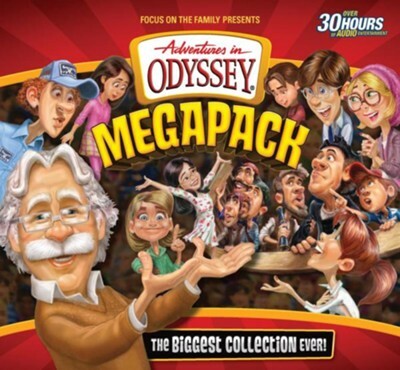 I'm the author/artist and I want to review Adventures in Odyssey Megapack CD Library-75 Episodes on 25 CDs!.